The sixth volume of DC Comics’ Batman run features a collection of standalone issues and two-part storylines concocted by a variety of writers and artists. While previous volumes of Batman were seismic in their revelations and outstanding in their execution, Graveyard Shift isn’t as cohesive, and lacks the spark that made its predecessors essential purchases. Even so, it’s a fine prologue to Scott Snyder and Greg Capullo’s next blockbuster story-arc, Endgame, which is just now wrapping up in the comics. 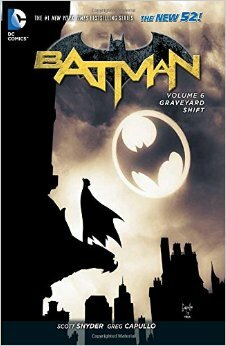 Speaking of the acclaimed writer and artist pairing of Scott Snyder and Greg Capullo, they are the glue that holds Graveyard Shift together. Their Clay Face epic is brilliant, revitalising a long-dormant character, and their ‘zero’ issue, which turns back the clock and serves as a prologue to ‘Zero Year,’ is a lot of fun. Volume 6 of Batman turns the spotlight on less-vaunted writers (which is not to dismiss their sizable talent, because most creators pale in comparison to the megastar Snyder) such as James Tynion IV, Marguerite Bennett, Gerry Duggan, partnering them with incredible artists such as Any Kubert, Matteo Scalera, Alex Maleev and Dustin Nguyen present their take on the Caped Crusader. Batman’s grief over the loss of his son, Damian, binds several of these tales – the Dark Knight has never been great at deaths in the families – but long-time readers will feel this is well-treaded territory, and there’s not much here that revitalises the narrative. Graveyard Shift also accelerates the world of Batman forward, showcasing a glimpse of the future in which Batman teams up with a new ally, Bluebird, as he takes on Gotham’s newest crime kingpin. It’s a solid story, introducing readers to a fresh status quo, but the collection’s shift from the past, to the present, and then to the future, means the volume lacks consistency. So the standalone story, The Meek, is therefore one of the most effective: really, it could take place at any time, and sees Batman solving a fairly standard (for him, anyway) serial killer case. Duggan and Scalera form a potent partnership to deliver a brilliantly dark story, and I hope to see them collaborate again. So Graveyard Shift isn’t the standout collection in the ‘New 52’ Batman, but its solid smattering of crime stories makes it altogether worthwhile.